A Week’s Worth of Food for $20 – she eats. Yesterday, I announced my intention to try and eat for a week on only $20 (an arbitrary amount based on what I had in my wallet at the time, but one that low enough as to be a challenge) and what I had in my pantry and freezer. I’ve been stockpiling blog posts to meet my three-per-day quota at work (as so much of what I write about has to do with eating out) and intend to cook every meal myself this week: breakfast, lunch and dinner. That isn’t much of an accomplishment for your average person. I get spoiled in my new line of work, frequently and excessively. I get to attend media dinners and eat things like foie gras torchons on a typical Tuesday for lunch and expense a significant portion of my meals. I often don’t put as much thought into the things I’m eating as I feel that I should. It’s a lifestyle for which I am endlessly thankful and one that I don’t ever want to take for granted. The decision to eat on $20 and what’s in my pantry (as you will see, I’ve gotten better at keeping supplies on hand) was borne out of this, but also out of a desire to eat and live more simply and yet more creatively. One day into the project, and I’ve already rediscovered spices and vinegars that were hidden away in my pantry — which, as you’ll see, is already very small to begin with — and use them to my advantage while cooking. Washing dishes, trimming fat, blooming spices, zesting fruit, et cetera: All are things which make me more mindful of the food I’m eating and which provide me with a very needed sense of calm and simplicity. The project was also borne out of a desire to truly look at the money that we’re spending on food as entertainment, not food as nourishment or food as a connection to our dining companions. $20 may seem like a difficult sum of money to eat on for an entire week, but that’s a budget that millions of people — here in America and in less wealthy portions of our world — have to adhere to every week of their lives. If they can do it, so can I and so should I. Forcing yourself to consider other perspectives and circumstances is crucial for leading a more enlightened, more considerate, more gracious and more thankful life. I intend to do a full writeup of the project when I’m finished, but for now, here’s my starting point. 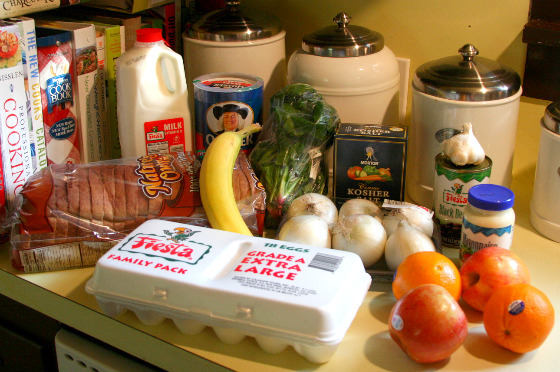 Below are photos of what I already had in my pantry and refrigerator, what I bought with $19.54 at Fiesta and what I made my first evening for dinner. I’ve already planned out every meal for the week, so I’m terrifically excited for the week ahead and can’t wait to see how it all shakes out. 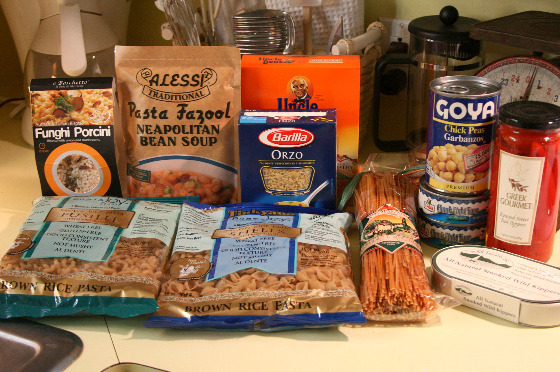 The "staples" I had in my pantry: two cans of tuna, a tin of smoked kippers, several rices and pastas, a jar of red peppers and a can of chickpeas. 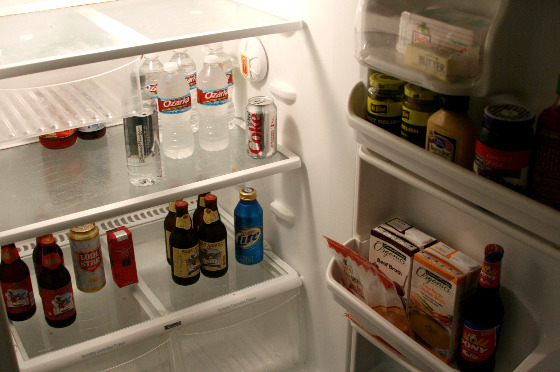 As you can see, I don't keep much in my fridge, mostly St. Arnold's and water. The broths and the shredded cheese had to be thrown away (expired), which left me with butter, mustard, grape jelly and two kinds of relish. 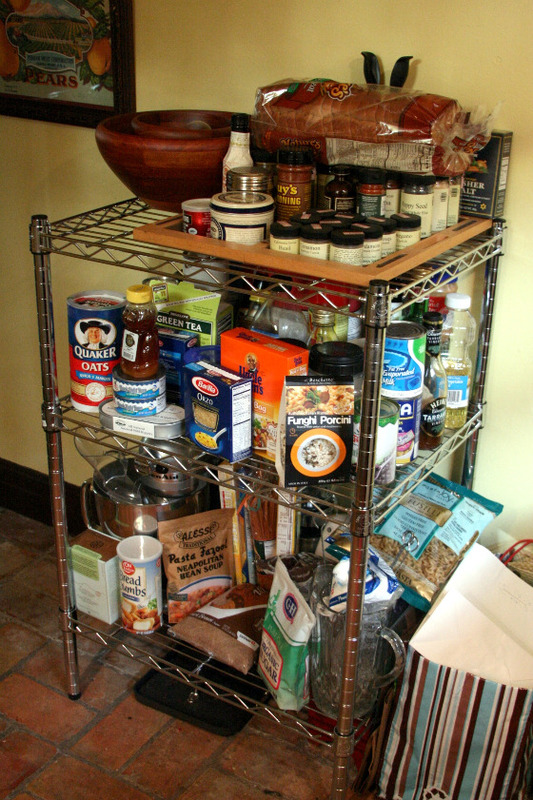 My "pantry" with spices, sugar, two vinegars, two oils, bread crumbs, tea, honey, a can of evaporated milk, powdered chocolate and all the "staples" put back where they belong as well as all the groceries I bought with my $20. All of the groceries I bought for $20. Not pictured: a pack of five chicken thighs, quarantined because they were covered with gross chicken juice. 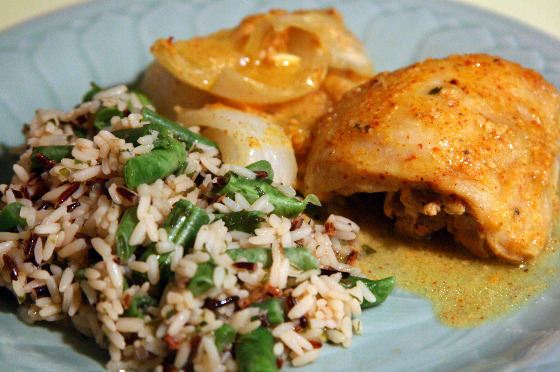 Last night's first dinner: One and a half baked chicken thighs, cooked with a mustard-tarragon sauce over garlic and onions, served with wild rice and green beans. I really like this idea. By planning out a menu, I have really been able to cut costs and have much more exciting meals! Good luck this week! Can’t wait to see the results. Your experiment is cool. I have come up with more interesting things when I have to adhere to a very strict budget…hence the creation of a grape jelly butter sauce one day. Having a budget makes you think outside the box and makes us appreciate the lavishness of being able to dine out. Kudos to you! I disagree, at least here in America. I don’t know one single person in real life that cooks even every night for dinner as a general rule (well, me), much less three meals a day. Anyone COULD do it, but it takes more planning and thought and effort than most people are willing to shell out. Cool! I’m looking forward to seeing what you come up with. Food these days really is entertainment for a lot of people, me included, but I think it’s important to step back from time to time and remember that eating is first and foremost a means of survival. (This is, of course, no excuse for eating cheap, disgusting, overly processed meals.) Looks like you’re off to a good start! This is such a great idea! I want to do something similar because frankly, the amount I spend on food is just ridiculous. I also think we need to get back to family dinners – just taking the time to sit down together at the end of the day. I notice some Tinkyada in your pantry supplies… do you know someone allergic to wheat or gluten? I could live on Barilla pasta, salt, and olive oil, and canned tuna alone, as long as the tuna is cured in olive oil. I’m with your mom on this a well-stocked pantry is key. But buying meat on sale and planning are crucial too. And these days all your extra money will go right in the gas tank. Oh and one other thing, start making your own broth. It’ll save you money and it tastes better. $20 – Thats pretty challenging. A few Kombuchas and a couple of smoothies, some veggies and I’d be spent pretty quick! Pasta would certainly be on the list, its easy to cook and goes a long way.